Almost a month ago now (wow!) Jenn, Phoenix and I went to Disneyland with my parents for a three-day park-hopping adventure. 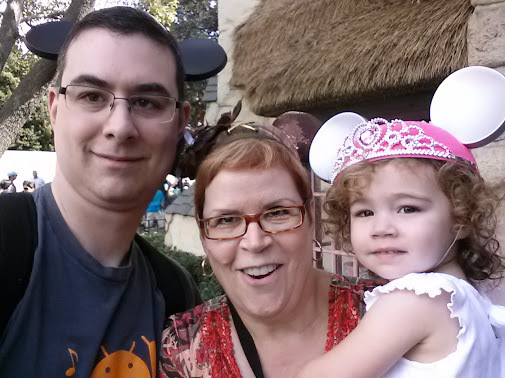 It’d been four years since Jenn and I had been, and far longer than that for my parents, so we were excited to go. 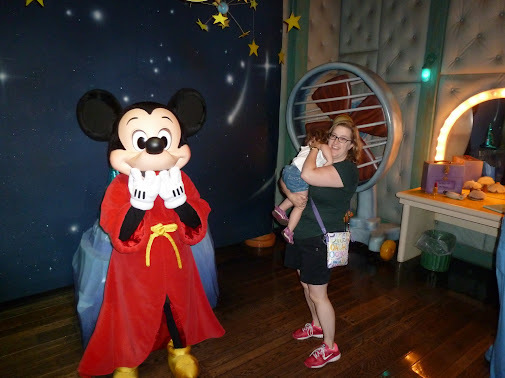 With Phoenix not quite being two, we figure she probably won’t remember much of the trip when she’s older, but she’s super into Mickey Mouse Clubhouse right now, so she’d at least have fun. 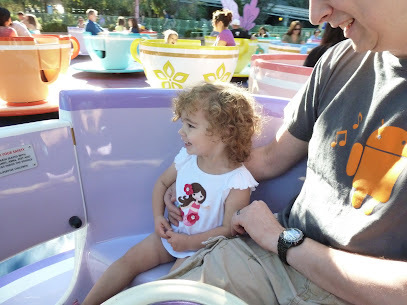 The first ride Phoenix went on was the Mad Tea Party tea cups. She loved it. I’m glad she did for a couple of reasons. First, she likes carousels but she hasn’t really been on much besides that. 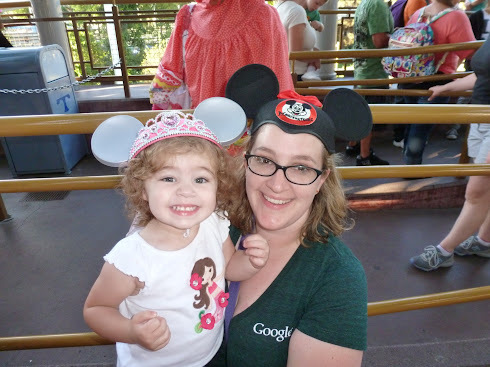 I was afraid the tea cups might be too much, but she wanted more and smiled and giggled the whole time, so that was a relief. Second, both Phoenix and I are big Alice in Wonderland fans, so I’m glad she had a good first ride on an Alice-themed attraction. She didn’t seem to have a problem with the human characters (princesses, pixies, pirates) but the costumed characters that weren’t human were only allowed within about 10 feet before the alarms went off. We even tried one of the “character breakfasts” where you eat and the characters walk around from table to table. That didn’t go over well. Chip showed up and tried to say hello and Phoe went all DEFCON ONE ALERT ALERT ALERT so Chip backed off and that was pretty much the end of that. We had actually scheduled the character breakfast at “Goofy’s Kitchen” because last time we were there the characters got all the kids to come out and bang pots and pans and dance. Phoenix is all about that sort of thing and we thought it’d get her to relax around the characters. Apparently they stopped doing that because parents complained that as the kids were coming back from the dancing, the characters continued to walk around and mingle and the unseated kids would miss characters coming past their table. I dunno. I think I’d rather have the dancing. …and Phoenix wore hers everywhere. Even now, a month later, she still loves that hat. 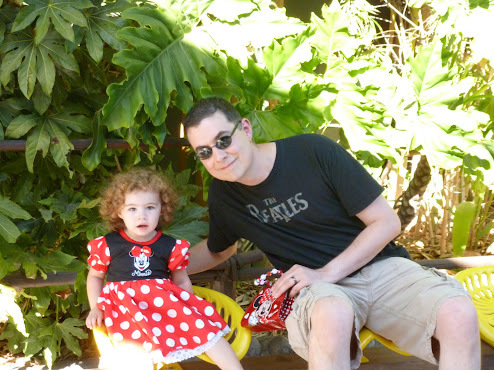 She also ended up getting a Minnie Mouse dress, which she also wore all over (and still does). The big new attraction was Cars Land in the California Adventure portion of the park. We saw most of it, but it was pretty packed - even in the middle of October - so we didn’t get to see the whole thing. We also sort of left that for the last day and ran out of time. We did get to ride all the other rides - from Splash Mountain to Star Tours, the Grizzly River Run to Soarin’ Over California. We missed quite a few last time we were here so it was good to catch them this time. We’ll try for the Cars Land rides next time. Jenn lost her sunglasses on the Indiana Jones ride last time we were here, so I had to match her and lost my sunglasses in “Captain EO.” You’re probably wondering how I lost my sunglasses in a movie… I was, too. They must have just fallen out of my pocket. I realized as soon as we got out the exit, but when I turned around to go back the doors had already shut so I ran around to the ride attendant and explained the situation. Since the next show had already started I had to wait the 17 minutes for the movie to end, then I could go back in through the exit doors and search. That was honestly a pretty rough 17 minutes. I wouldn’t have been so worried if they were just $50 sunglasses or something, but they’re prescription - way, way more than $50. Anyway, I went back in and searched for the two minutes they give you between when one crowd leaves and the next is seated. I didn’t find them, even with the attendant’s help. I called out to the audience members to see if anyone saw them but no one did. Jenn and I then got to sit through “Captain EO” again, you know, because they won’t let us do any real searching, and we searched again for the two minutes. I got some pretty harsh rug burns on my knees from that. Finally, after the second round of “Captain EO” (which I am now thoroughly sick of) one of the audience members announced he’d found my sunglasses and handed them to me. Thank goodness. It was an hour lost, but a couple hundred bucks saved. Big props to Jenn for standing by me on that one. 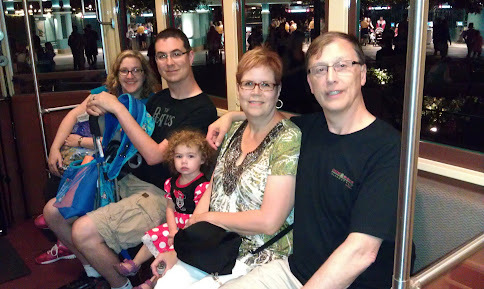 It was a fun, but long, vacation and at the end I think we were all ready to go home. Phoenix was a trooper, really being good most of the time despite the record heat (~95F each day) and not getting a nap. Toward the end we were all tired, she was starting to get naughty, and we’d all walked our feet off. I think that’s part of what makes it a good one, yeah? I posted a few more pictures for folks interested. Good times, and I look forward to the next vacation.